greater dimension to be processed. hopper (tube pusher) 60mm in diameter. * Ideal for carrots zucchini cucumbers etc. GN containers (up to 20cm). seconds by opening the cover. for easy cleaning and are dishwasher safe. 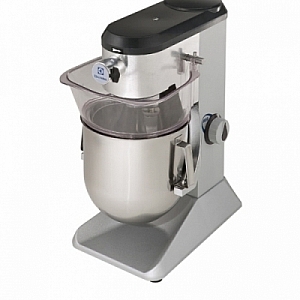 Professional 8 litre capacity planetary mixer to perform all the functions of a beater mixer: kneading all types of doughs and pastries mixing semi-liquids emulsions and various sauces. Ideal for all types of food establishments. Sturdy and built to last. Can be used on a variety of food types pastries dough sauces etc.